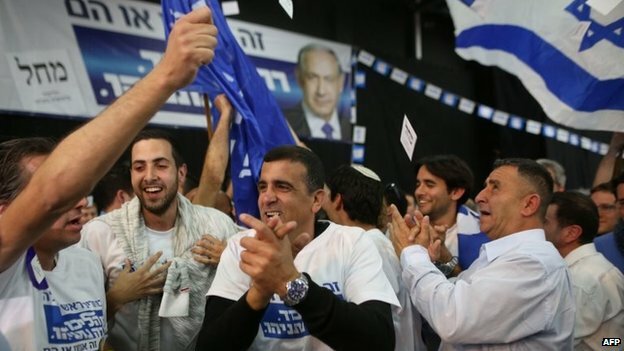 Prime Minister Benjamin Netanyahu's right-wing Likud Party has won a surprise victory in Israel's election. Exit polls had forecast a dead heat but with almost all votes counted, results give Likud a clear lead over its main rival, the centre-left Zionist Union. The outcome gives Mr Netanyahu a strong chance of forming a right-wing coalition government. The result puts the incumbent on course to clinch a fourth term and become Israel's longest-serving prime minster. The latest tally gives Likud 29 seats in the 120-seat parliament, the Knesset, with the Zionist Union on 24 seats. In a speech to his jubilant supporters in Tel Aviv after Tuesday's polls closed, Mr Netanyahu said he had already spoken to the leaders of other right-of-centre parties about forming a new government "without delay". He described the vote as a "great victory" for Likud, which had trailed the Zionist Union in opinion polls in the run-up to the election. Mr Netanyahu said the result was achieved "against all odds". In the end Israeli opinion polls told the wrong story, yet again. Benjamin Netanyahu scored a much bigger victory than the exit polls had suggested. When the polls closed his main opponent Yitzhak Herzog was able to say it was a tie, the best result for the left in more than 20 years. But overnight, as the real results emerged, Mr Netanyahu and his governing Likud party emerged as clear winners. The polls suggested Mr Herzog was close to an outright victory. He broke through by not letting up on social and economic issues. It would have been a sensational result; the Israeli left had been in the doldrums for a generation and Mr Netanyahu was a clear favourite when he called early elections in December last year. Even in defeat, Mr Herzog has now established himself as the undisputed leader of his party. Speaking after the exit polls were published, Zionist Union leader Yitzhak Herzog told his supporters he was confident of forming the next government. "We have achieved an unbelievable achievement today. I will do all that I can in order to create a real socially minded government for Israel." When final results are known, President Reuven Rivlin will give the task of forming a government to a party leader who he thinks has the strongest chance of assembling a coalition. Israel's form of proportional representation always produces smaller parties and coalition government, the BBC's Middle East editor Jeremy Bowen in Tel Aviv reports. No party has ever won an outright majority under Israel's proportional representation voting system. Almost 72% of those eligible voted in the election, which ended at 22:00 local time (20:00 GMT). The turnout was four points higher than the previous election in 2013. The Joint Arab List, an alliance of Israeli Arab-dominated parties, came third with about 13 seats, the exit polls suggested. It has said, however, that it will not take any positions in government. Mr Netanyahu had vowed not to allow the creation of a Palestinian state, while Zionist Union expressed support for a two-state solution and promised to repair relations with Palestinians and the international community. Benjamin Netanyahu: Victory for his Likud party could mean a fourth term for the veteran of Israeli politics. His hawkish stance on the Palestinians and Iran have made him popular with the right but a divisive figure. Yitzhak Herzog: The co-leader of the centre-left Zionist Union electoral alliance, Mr Herzog has accused Likud of depressing Israeli living standards and campaigned against Mr Netanyahu's foreign policy. He has tried to counter Mr Netanyahu's accusations he is "soft" by pointing to his special forces background. Tzipi Livni: Mr Herzog's co-leader in the Zionist Union, Ms Livni is a prominent advocate of seeking more co-operation with the Palestinian Authority. Moshe Kahlon: A former Likud welfare and communications minister under Benjamin Netanyahu, Mr Kahlon's centre-right Kulanu party could play kingmaker in a coalition.